If there is a project that clearly stands out as needing immediate attention, that is the best place to start. Maybe you have recently moved into a home where the previous owner’s dog or cat destroyed the carpeting in the living room. Perhaps, all your kitchen appliances are outdated and need to be replaced right away. Maybe a roof leak caused damage to the walls and flooring in a bedroom. These are all indicators that your home remodel should likely start in that specific room. Other projects that might need to be placed as a top remodeling priority include a nursery for a baby that will be born soon or an additional bathroom if you have a large family. Some people like to get the largest project out of the way first. Even if it is just one room, there is a huge sense of accomplishment when the biggest project is done. Plus, starting with the biggest project allows you to see if you are ready for the time and money associated with remodeling your entire home. Often, the largest remodel project in a home is the kitchen. With a complete kitchen gut, you are likely replacing the cupboards, getting new appliances, installing new countertops, and replacing the flooring. New lighting may also be installed to make the room brighter, to put in more lighting, or for aesthetic purposes. In some cases, a wall may be taken out to expand the kitchen. With a major kitchen remodel, extra storage, including larger countertops and more cupboard space, may also be added. In some cases, that includes creating an island in the kitchen. Sometimes, the project may also include adding windows or new sliding glass doors to add more natural lighting in the kitchen. The remodel may also include switching the locations of your appliances. Other large projects include redoing a bathroom, converting an unfinished basement into usable space, and adding a room to a home. Any major remodeling project may take several weeks. Be ready for that part of your home to be inaccessible during the remodel. In some cases, you may need to stay with a family member or friend during the remodel. On the opposite end of the spectrum, some people like to start with a part of their home that will only require minor changes. Maybe you just want to change out the master bedroom carpeting for new hardwood flooring, and then you want to have the walls repainted. Perhaps, you want to add some built-in shelving along one wall, or you want to make other minor but important changes to your home. One great thing about starting with a small project is that it gives you a taste of remodeling your home. You will likely be able to continue living in your home during a small remodeling project, and you may only be inconvenienced for a few days. Not only will you get a taste of what it is like to live in a construction zone, but you will get a taste of how much it will cost to remodel your entire home. Starting with a small project can help you see how much you need to budget for the bigger projects. Plus, for a lot less money than it would cost for a large project, you can be headed down the path of remodeling your home. Often, it is a good idea to start your whole home remodel with the room you use the most or at least a room you use often. If your family gathers in the living room to play games, watch movies, and talk, you will likely enjoy a living room remodel a lot more than you would enjoy remodeling the rarely used guest bathroom. If your family spends a lot of time cooking together, a kitchen remodel might be a good place to start. Because you are spending considerable time enjoying your newly remodeled space, it will help to keep you motivated to continue saving money to be able to remodel the rest of your home. While you can likely handle simple home projects, such as repainting a room, on your own, larger remodeling projects should be handled by professionals. If you are ready to get started remodeling your home, contact us. 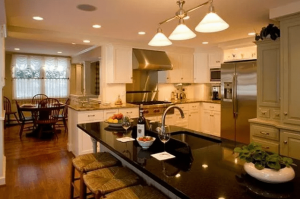 Our experienced home remodeling contractors can help you transform your home, whether you want a full home to remodel or you just want to remodel a room or two.